Simple and moist two-layer carrot cake with pecans and cream cheese frosting. Apple pie is my favorite dessert. This you already know. Coming in a very, very close second are other classic non-chocolate (I know) desserts like pineapple upside-down cake, oatmeal raisin cookies, key lime pie, and carrot cake. But in reality, they’re all my favorite. I can have, like, 10 favorites right? I know you understand the difficulty choosing a favorite dessert. Fellow bakeaholics, you just get me. Today’s focus is carrot cake. Or should I say this weekend’s focus was carrot cake. In between a much needed wine tasting girls day (Chaddsford Winery if you’re in the Philly area– go to their wine & fondue tasting!) and a visit to NJ to see my friend’s new baby girl, I spent time in the kitchen perfecting this two layer beauty. I can’t process that. Let’s change the subject. I’ve been making this super-moist carrot cake for years and it wasn’t until this weekend that I decided to turn it into an even taller, even greater two layer phenomenon. Today’s layered carrot cake cake is, you guessed it, just as moist as my original. It’s loaded with that comforting spice flavor we all know and love. It’s soft, yet dense. Tender, yet mighty. Bursting with shredded carrots, toasted pecans, and luscious cream cheese frosting. It’s a total classic and spring isn’t complete without it. Food Science // Nerd Alert ! 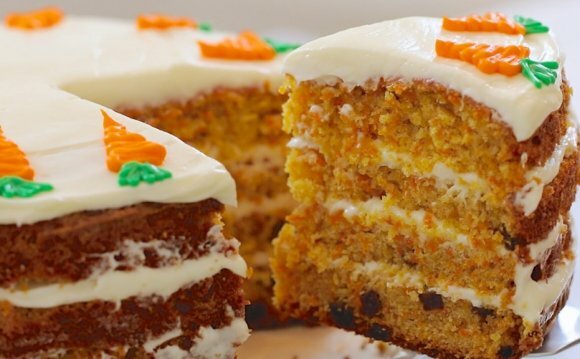 My carrot cake is a soft and dense cake whose flavor comes from brown sugar, cinnamon, ginger, nutmeg, and carrots. Brown sugar is key. I’ve come across a lot of carrot cake recipes that are sweetened with mostly granulated sugar. To me, that doesn’t do much for the cake at all besides sweeten it. Brown sugar not only sweetens the cake– it gives so much flavor and moisture. More bang for your buck, right? Ginger is a recent addition to my carrot cakes. I enjoyed a carrot cake a year or two ago that had a hint of ginger flavor and ever since then, I’ve loved the little ginger “zing!” in my homemade carrot cakes. I add a little applesauce to enhance the warm flavors of brown sugar and cinnamon. Fresh and flavorful Diamond of California pecans round the whole cake out, making every bite of this sensational classic bursting with not only flavor, but texture as well. Plus, they’re the perfect decor! For a little extra jazz, I recommend toasting them. Yum. Soft cake, toasted pecans, smooooooth cream cheese frosting. Sometimes I add raisins to the cake– I’ll note that in the recipe below. Also in the notes is my suggestion for adding pineapple. I know a lot of you love that. As far as moisture goes? This cake has a lot of it! I couldn’t eat carrot cake any other way. I prefer to use oil. When preparing cakes without other strong flavors such as, I like to use butter. But for cakes like chocolate and carrot cake that have so much flavor from other ingredients, I find flavorless oil is the right choice when it comes to fat. To prevent the cake from being too moist and tasting oily, I add some applesauce (also for flavor!). And the carrots. So much moisture there! Make sure you are using freshly grated carrots, not the pre-grated carrots from the store. Those are usually very dry in comparison. You’ll need about 4 large carrots for this recipe. And when you grate them, you’ll notice how wet they are. That is PRIME moisture for your baked cake. The frosting? Well, that’s easy. It’s the same cream cheese frosting recipe I use for just about everything from red velvet cake to lemon cake. It’s like smooth, silky spreadable cheesecake. And there’s a ton of it on this cake. One of the BEST parts about carrot cake is that it gets better and better over the hours, even after a day or two. The flavors have a chance to mingle, the moisture prevails, and the cream cheese frosting sets into the layers. This is the kind of moist cake crumb that sticks to the bottom of your fork as you take each bite. And the slice that you never, ever want to end! Wine, fondue, friends, babies, and my favorite carrot cake. Weekends don’t get much better than that right now. Happy spring baking!